That’s pretty crazy, isn’t it? It’s like someone overturned a truck full of frogs in the middle of the road, and just waited while they all hopped off! 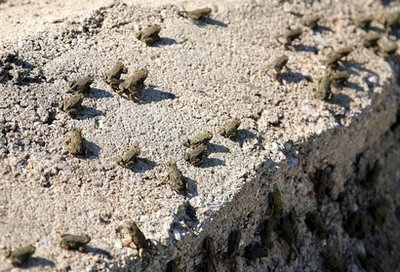 Fortunately for Greeks, these were just little, normal frogs and not super-monster fanged frogs, otherwise there might be trouble. It’s amazing they closed the road for two hours to let the frogs pass, when they just could’ve given a road crew some push brooms and had them sweep the frogs off to the side of the road, or thrown frog feed into the closest lake and lured them all away. When all else fails, you fight a horde of frogs with a horde of hungry French people.